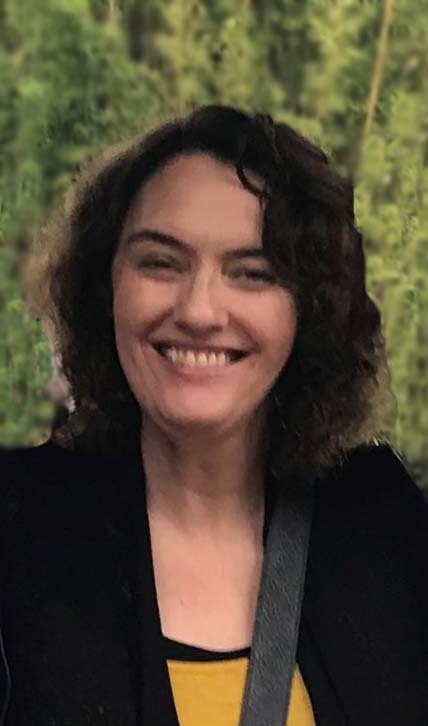 The theme for 2019 came to Anne-Marie Zell Schwerin during a sleepless night in December. “It was after the new board orientation. Our board member Liza Jacobson advises Leadership Academy at Blue Ridge Elementary and told us that YWCA Mariposa girls are the core of that group. 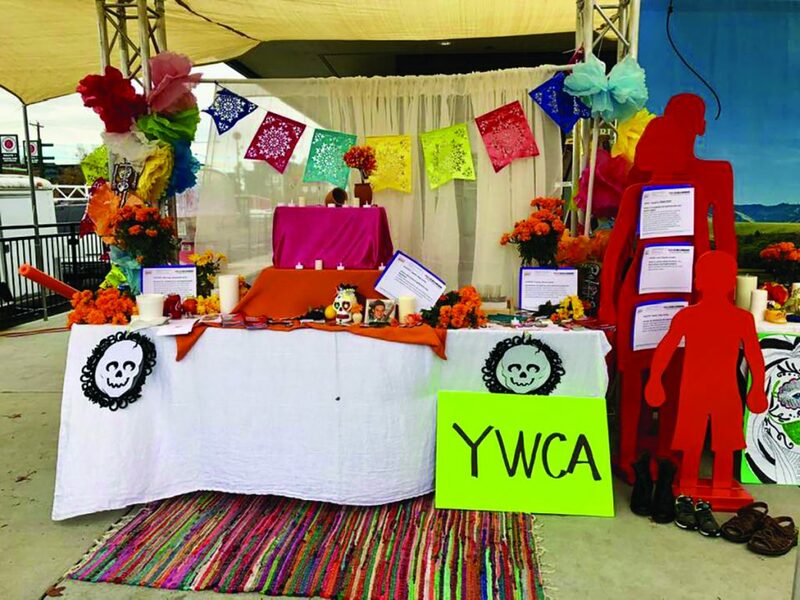 Leadership Academy students do service projects for their school, but these girls want to take it further, to serve their communities, to change the world,” said the YWCA Executive Director. 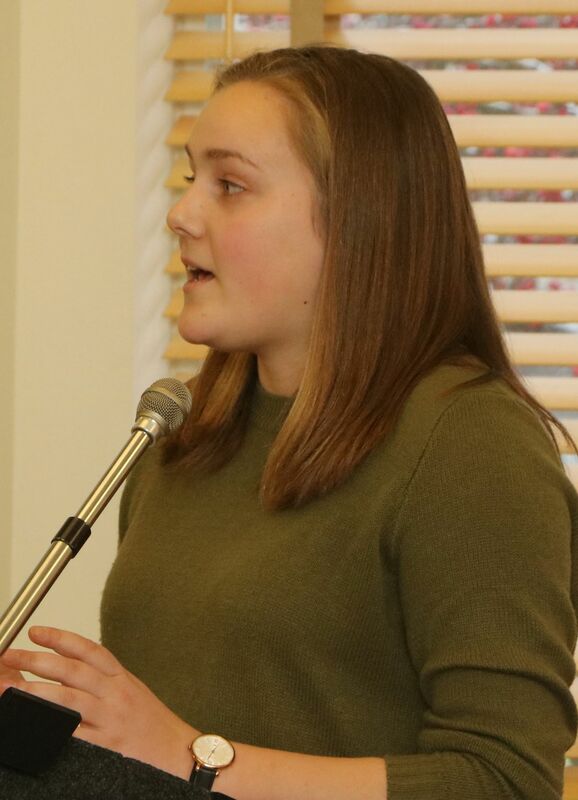 With a theme like that, and knowing the YWCA mission is all about sending girls and women on their way to better lives, the obvious choice for a luncheon speaker would be a young woman on her way. This search didn’t take us far from home and in fact led us just over the Cascades to Faith Nyakundi. 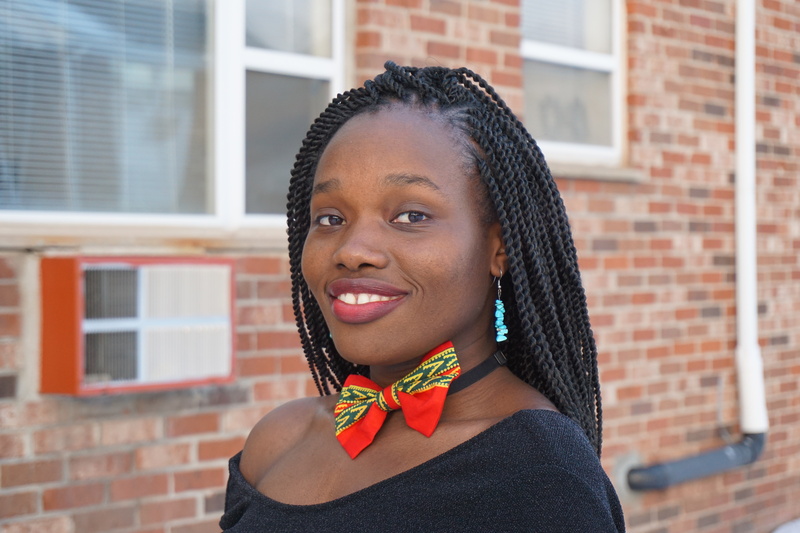 Faith is working on a master’s degree in International Studies at the University of Washington where she is focusing on two large areas: foreign direct investment between China and Africa, and transnational feminist activism. 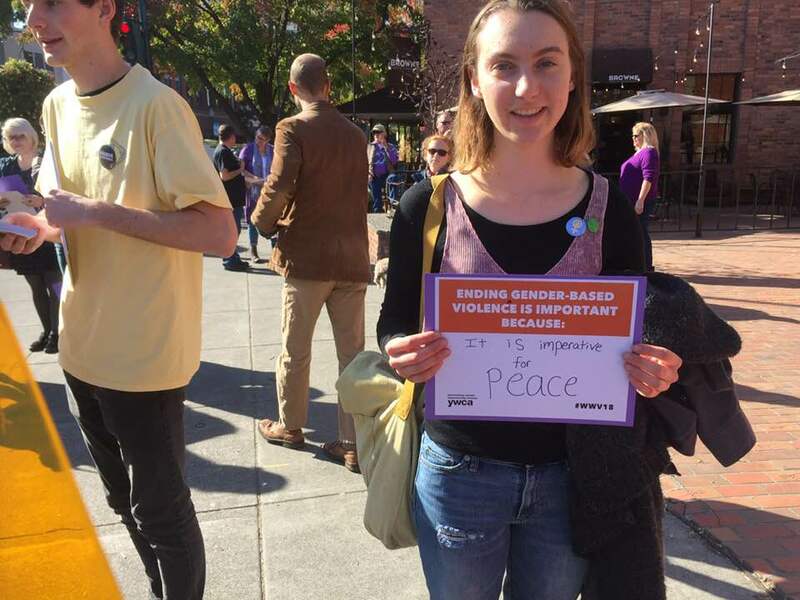 She hopes to go into policy and peace negotiations and to continue advocating for women’s rights. A Whitman College graduate, Faith came to YWCA Walla Walla near the end of our centennial year to serve as Events Coordinator and a part-time DVSA Advocate. Her first event was the release party for our centennial book, INSPIRED. Before coming to Walla Walla, Faith spent the majority of her first 18 years in the Mukuru Kwa Njenga slums of Nairobi with her family of nine. With determination to change her life and her family’s, she worked to find opportunities outside Mukuru because of its lack of education resources and career opportunities. She was top of her class in the national primary school examinations, which gave her a chance to attend one of the best boarding high schools in Kenya, Precious Blood Riruta. Getting into school was one thing; staying depended on being able to raise tuition. This was right after the 2007/2008 post-election violence in Kenya, and her family had just lost land which made up most of their income. She braved it anyway, and on her second term in high school, she was invited to apply for Akili Dada. The organization covered her tuition and school needs for four years. By choosing to invest in this bright young Kenyan woman, Akili Dada put Faith on her way to a better life for herself, her family, and potentially the people of her country. Hear about her journey and her plans for the future at the 2019 YWCA Leadership Luncheon. The luncheon will take place from noon to 1 p.m. on Wednesday, May 1, at the Marcus Whitman Hotel & Conference Center. Registration begins at 11:30 in the hotel lobby. If you’ve attended in the past, you can contact your Table Captain about tickets. We do have Table Captain turnover every year, so if you haven’t heard from anyone by April 1, please don’t be shy about calling the YWCA at (509) 525-2570. There are many lovely people we would love to place you with who would welcome you to their table. Tickets and more information is available on the YWCA luncheon website. On May 23, 2017, we celebrated the 100th anniversary of our YWCA charter with a birthday party. A letter and the above certificate from Secretary of State Kim Wyman’s office alerted us to another anniversary. 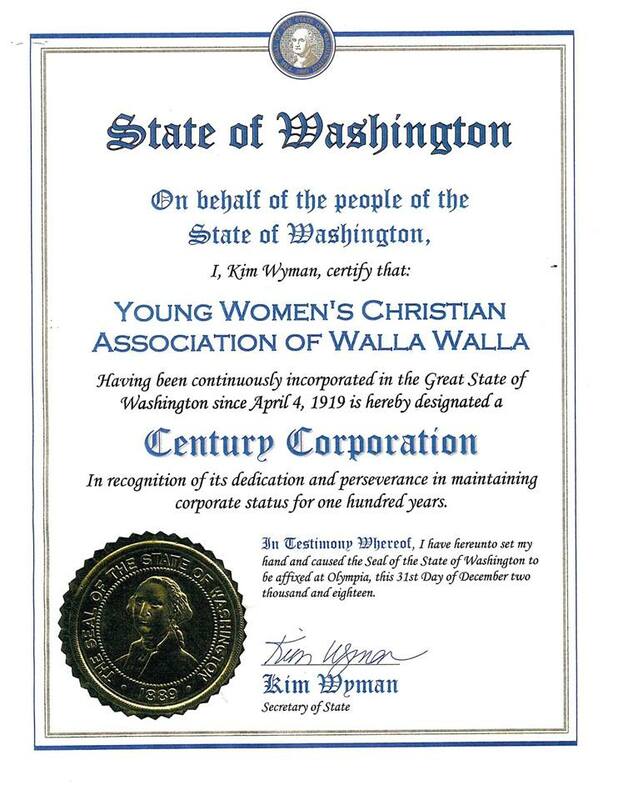 This Century Corporation Certificate commemorates our incorporation 100 years ago in April 1919. “Incorporations were at that time either delivered by horseback, steam wheeler or train. Because few owned cars, and the roads outside of Olympia were virtually impassable, incorporating a business was quite an adventure,” the letter said. We don’t have a record of how, but no doubt the women who raised a year’s operating expenses ($5,000) in one week were up to the task! Nearly 2,500 incorporations were filed in Washington state in 1919, and only 23 still exist today, two in Walla Walla: YWCA and Colfax Consulting Service. 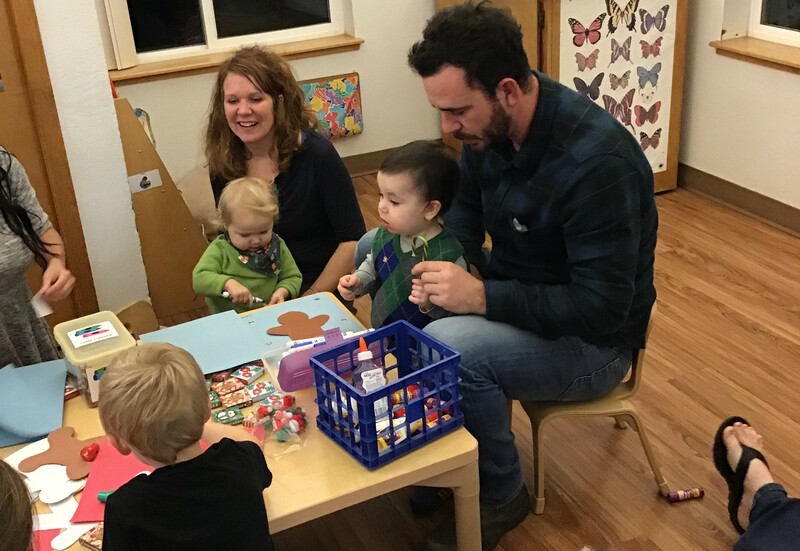 “When I first started exploring the possibility of becoming an Early Achievers childcare center, I put the question to my staff: Do we want to take on all his extra work?” said Tabitha Vance, YWCA Director of Childcare. She explained to her team that the accreditation process would mean having observers in classrooms for two hours or more, watching their every move. It would mean more training and reams of new record-keeping. And it meant striving to provide the very best experience for every child in the program. “What makes me so proud of this staff is that they were behind the effort 100 percent. 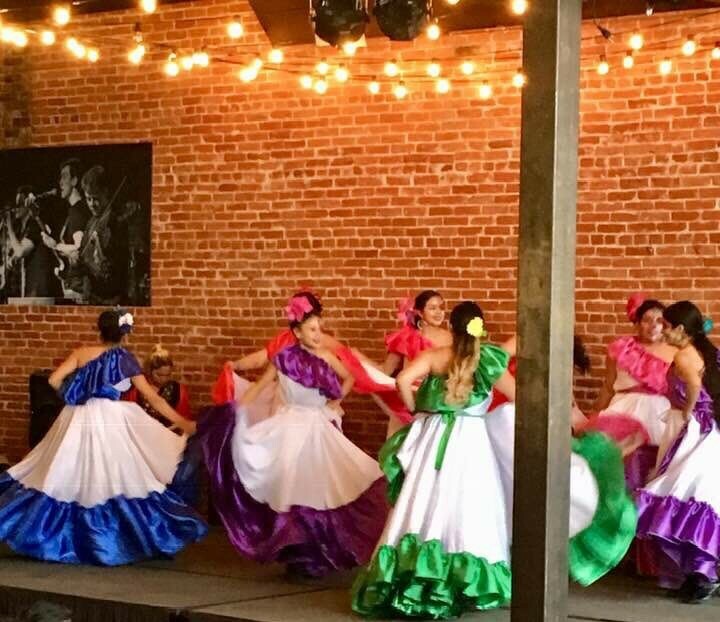 And they are determined to get to the next level!” At their first evaluation, Tabitha and her staff were thrilled to earn a three-star rating. The next evaluation will be this spring, and the staff hopes to maintain this level and eventually add a fourth star. 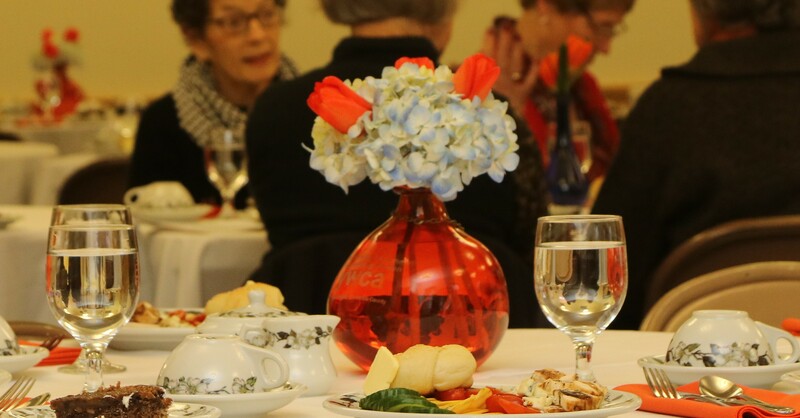 YWCA Walla Walla’s Fireside Room was festive on Monday, February 4, when nearly 80 friends joined staff and board members at the 101st Year-in-Review Luncheon. The annual event celebrates the previous year’s accomplishments and those people who have helped YWCA staff serve women and families. YWCA LiNC Director Deana York spoke about the program’s first year. LiNC, Living in New Circumstances, focuses on helping people move beyond survival and learn practical skills that will help them thrive. One of the 46 domestic violence survivors (pictured, right) who has completed the program spoke movingly about her newfound self-confidence. In addition to sharing successes, several individuals and businesses were recognized for outstanding YWCA service. Board member Anne Moore (pictured with board member Kristine Holtzinger) received a staff award for her work highlighting the YWCA at community events. 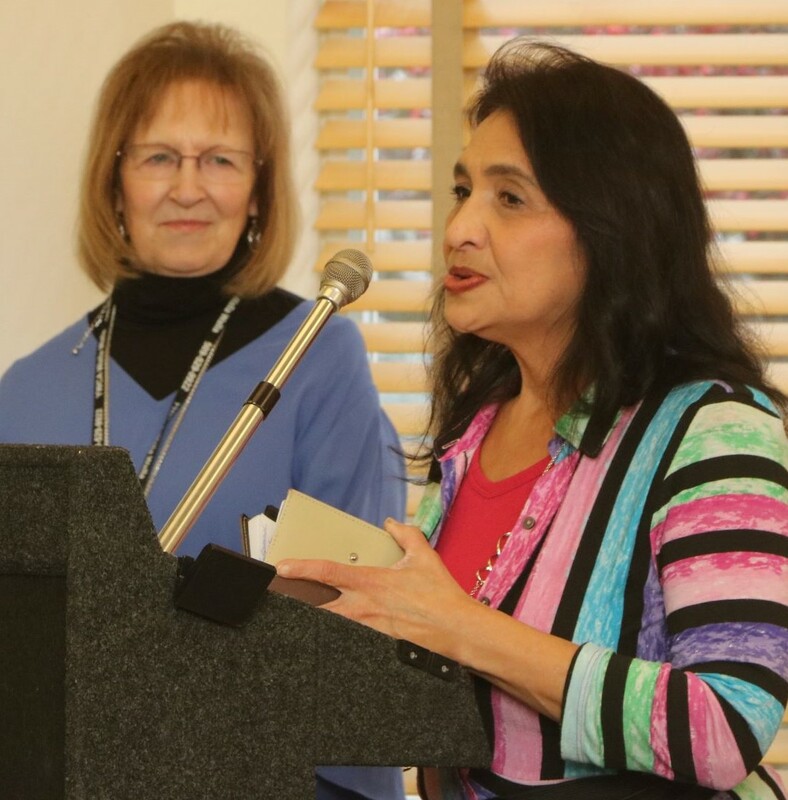 Office Assistant Luna Fairbanks was honored by the YWCA Board for setting an extremely high bar when it comes to representing the YWCA and its clients. The staff volunteer award was presented to Whitman College senior and YWCA Intern Maeve McCracken. 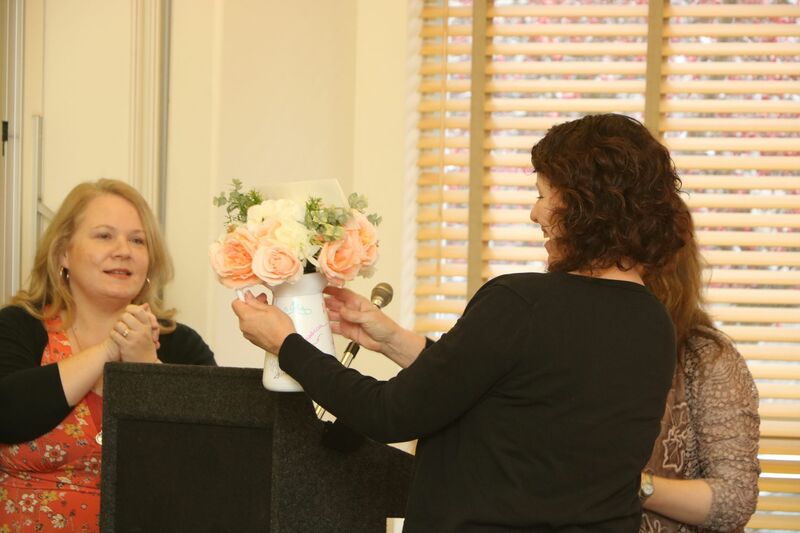 Community partners Northwest Collision, Whitehouse-Crawford, Seven Hills Winery, Shop Eleven, Sweetwater Paper and Home, and DAMA Wines were each honored for their many contributions to YWCA Walla Walla. Maybe you’ve heard Dia de los Muertos, or Day of the Dead, described as Mexican Halloween. But according to YWCA Advocate Lorena Ault, it’s much more than that. This year’s celebration took place the Wednesday before the two-day holiday that falls on Nov. 1, All Saints Day, which honors the saints and innocent children and Nov. 2, when all others are remembered. The festival is known for spectacular displays of bright flowers and beautifully decorated skulls. 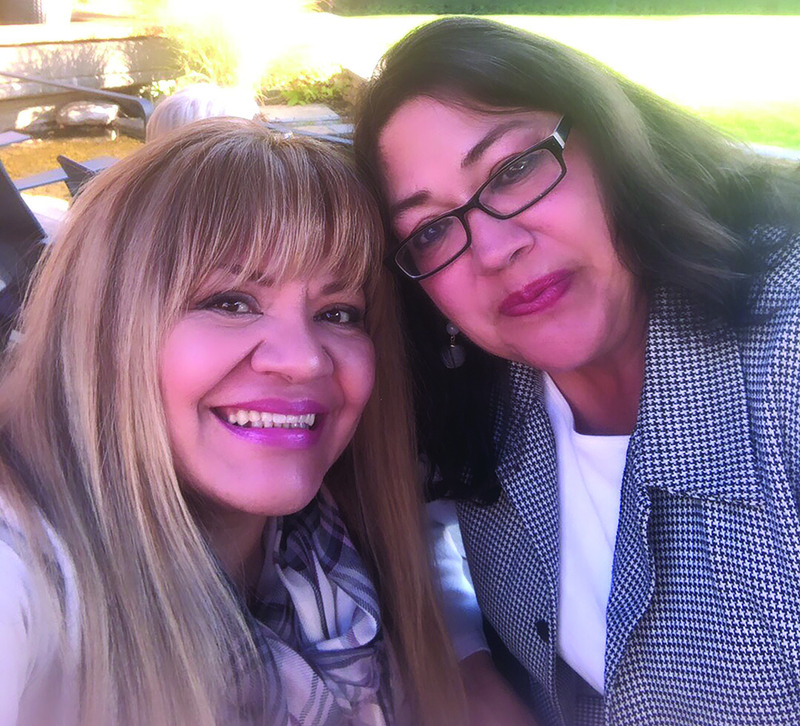 Lorena, along with YWCA Community Relationships and Outreach Coordinator Celia Guardado (pictured), led out in the festival planning, assisted by Whitman College Community Fellow Daphne Gallegos. All three are bilingual and bicultural. 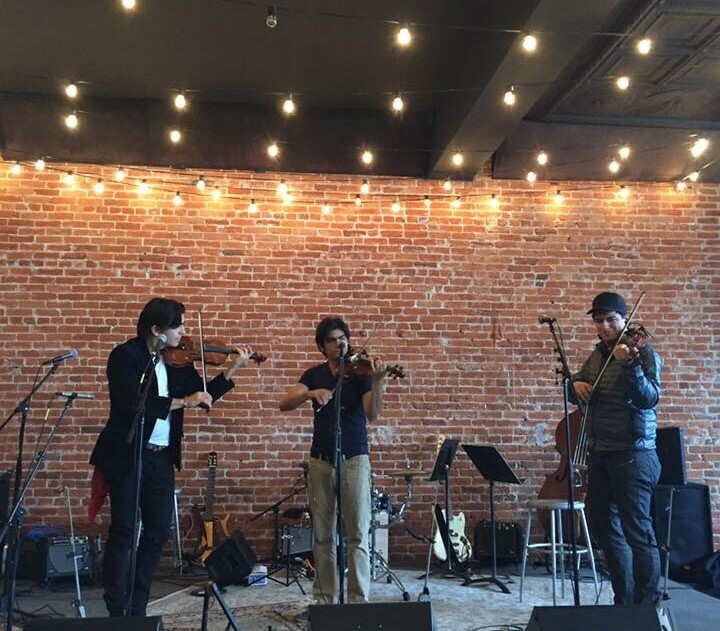 The event incorporated art, music (notably the Villalobos Brothers, pictured, who also performed with the Walla Walla Symphony), food, and dance. Central to the Day of the Dead is El Altar, a display created to celebrate, remember, honor, and keep a connection with lost loved ones. 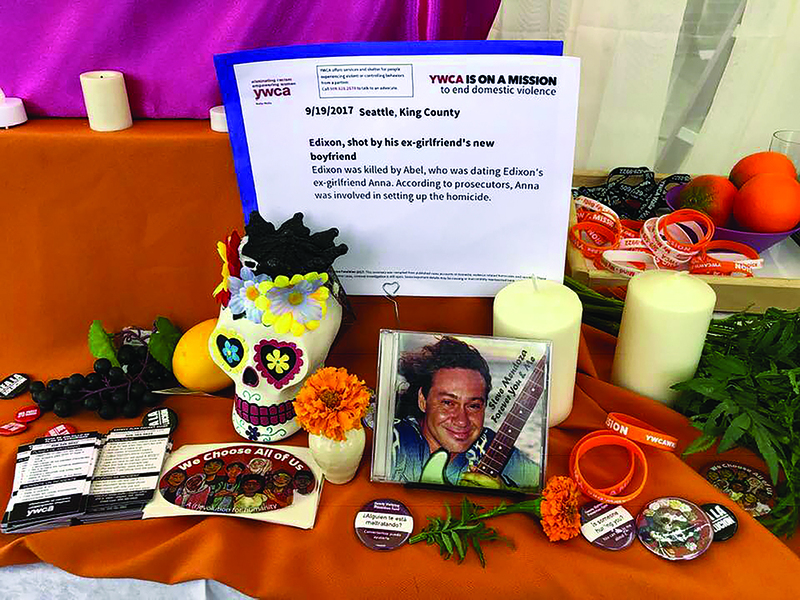 Lorena noted that memorial displays may not always be called “altars,” but every culture creates displays of love and remembrance in response to death or tragedy. After the death of a celebrity, a mass shooting, a fire, a natural disaster — whenever humans face grief or loss, especially a large, shared loss — displays of flowers, notes, toys, and more appear to comfort the grieving and honor the dead. The planning committee included representatives from many local organizations, including YWCA Walla Walla. In future years, the committee hopes to extend the building of healing altars to more groups who experience trauma, including perhaps veterans or first responders. On a December Saturday, nearly 60 fifth-grade girls from across Walla Walla came together for the Mariposa fall field trip. These girls have spent the past three months learning leadership skills in small groups with their classmates. The field trip allowed them to meet the other girls in the program for a day of fun. They rotated in groups through three different stations: a slime-making experiment, a planetarium show, and a martial arts class. 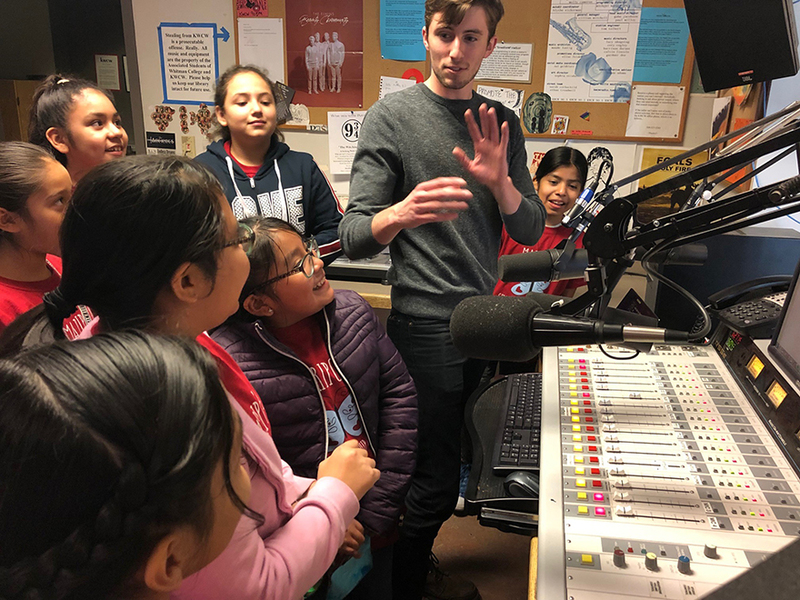 After the activities, the girls ate pizza and toured KWCW, Whitman’s radio station, which included a chance to talk and even sing on air! It was a great day that allowed the girls to have fun and create a community with other girls in the district who are also learning how to be successful female leaders. This was only one of many responses to the stories and corresponding shoes distributed downtown by YWCA Walla Walla with help from Walla Walla University student volunteers on Wednesday, Oct. 17. 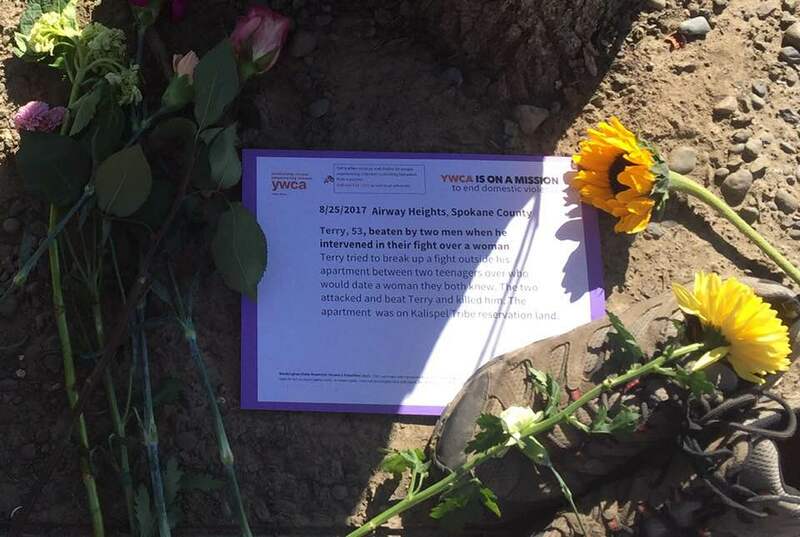 Part of Domestic Violence (DV) Action/ Awareness month, the 52 stories were compiled by the Washington State Coalition Against Domestic Violence from published news accounts of all the fatalities, a total of 70, attributed to DV in Washington state during 2017. 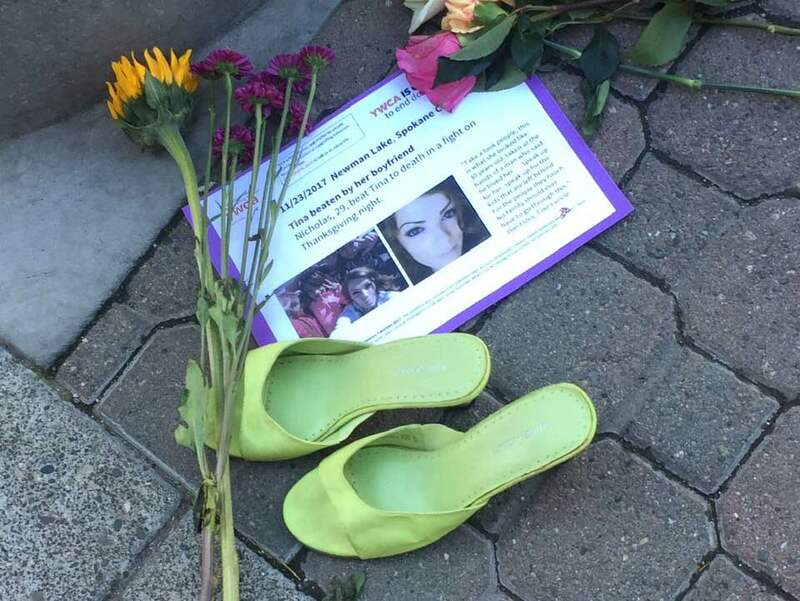 Our past board member watched several people see the shoes and react to them, says Anne-Marie, and said it made her feel proud to be part of the YWCA. 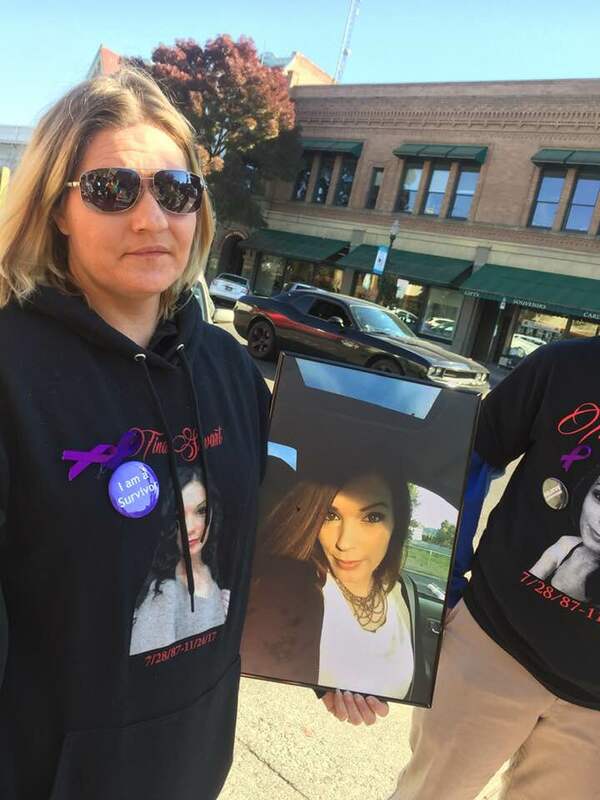 The “Take Steps Against Violence” walk took place over the lunch hour, starting at Land Title Plaza and marching through downtown to the Walla Walla County Courthouse. 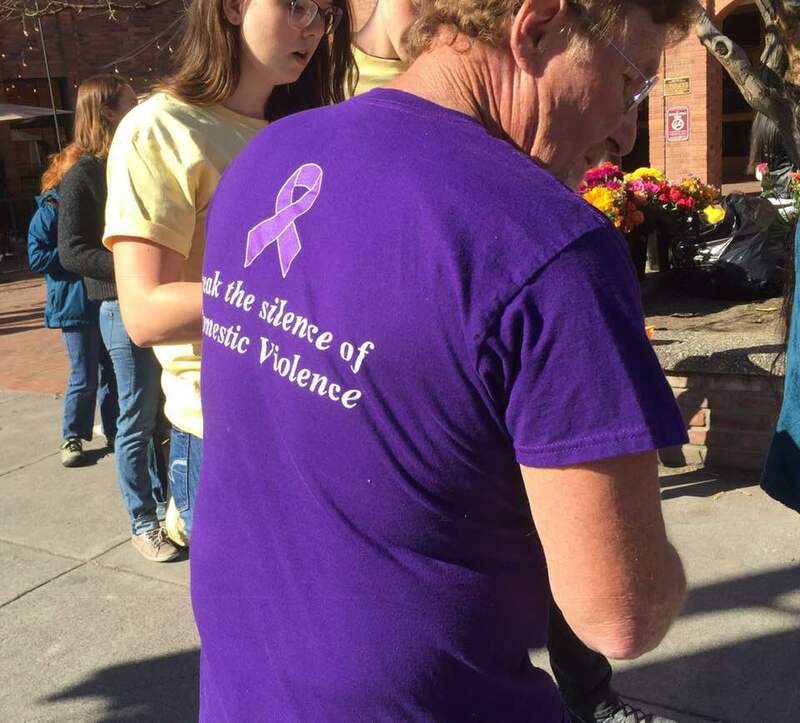 Most walkers — and even a couple of dogs — wore purple, the color of domestic violence awareness. At the courthouse, county commissioners read a proclamation making October Domestic Violence Awareness Month. Also at the Courthouse was Don Estes, uncle to one of 2017’s fatalities, Tina, a beautiful young mother to four small children, who was murdered by her boyfriend on Thanksgiving. Don spoke movingly about the kind of woman Tina was and shared how much her family misses her. Five of Tina’s relatives participated in the walk wearing special shirts to celebrate a remarkable life tragically cut short. View Tri-Cities television coverage here. 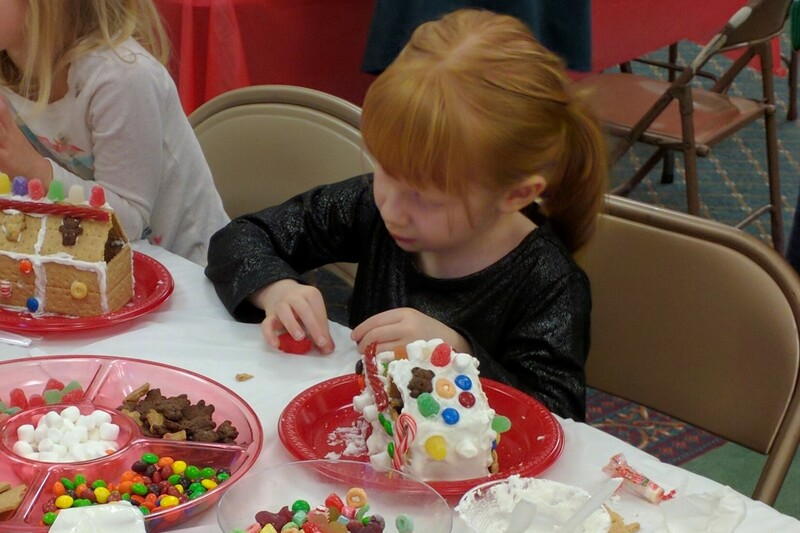 Kids of all ages are invited for a sweet afternoon of building holiday houses from graham crackers, super-stiff icing, and lots of fun candy at the YWCA on Wednesday, Dec. 12. The cost of this holiday tradition is $5 plus one non-perishable food item per child to share with the YWCA domestic violence shelter. Space is limited, so registration is required. Parents can sign up their child for 45-minute slots at 2:30, 3:30 or 4:30 p.m. by calling the YWCA at 509-525-2570. For children 5 and younger, an adult is kindly asked to stay for the duration of the event. The YWCA will provide plates, graham crackers, and lots of decorative treats for kids to build with. And after your children have completed their creations, you can leave the sticky mess for us! Best of all, since the food collected from “Hansel and Gretel” goes to our shelter, the afternoon offers a fun way to remind children about the importance of sharing and caring during the holiday season. YWCA Walla Walla is located at 213 S. First Ave.
On Monday, Oct. 29, YWCA Walla Walla hosted what we hope is our first Evening of Graceful Space. 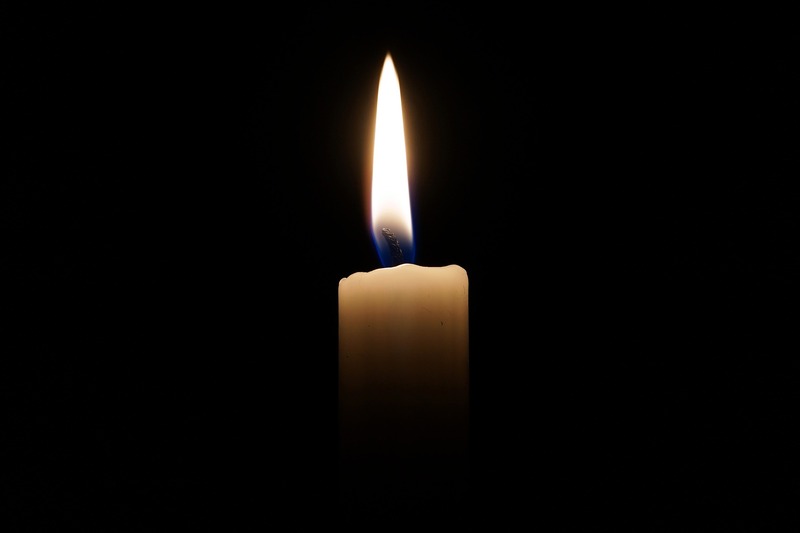 Recognizing the tense atmosphere that currently surrounds sexual assault, an intimate group, several of them strangers to each other, gathered for respite and support. There was no agenda for the evening, no goal beyond carving out some time to breathe in peace. In creating that space, people from diverse backgrounds were able to commune and enjoy each other’s company. The YWCA provided a light supper and beverages. If you weren’t able to attend and would like notice of the next opportunity, please email YWCAWallaWalla@gmail.com.